Check out these awesome Black Friday deals! Looking for some awesome shopping deals this Holiday weekend. I have great news Macy's is offering great savings on so many items for Black Friday shopping. The best part is you do not have to wait for Black Friday to start shopping. The sales at Macy's are already available and you can save an additional 20% off Black Friday sale items with Promo Code: BLKFRI through 11/24/18. I will be buying the Martha Stewart Collection Collector's Enameled Cast Iron 6 Qt. Round Dutch Oven as I need one in my kitchen. 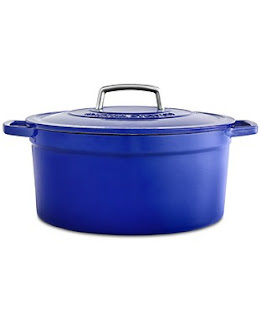 This Dutch oven is on sale for $49.99 that is 70 % off the original price of $179.99! Now to decide which color to buy it in as I love all the color that these 6 Qt. Rounds come it. I think the Indigo and Teal are my favorite colors. As this amazingly low price, I might just splurge and get two of the Dutch Ovens from the Martha Stewart Collection. So check out the below Macy's ad and see what amazing deals you can score for Black Friday shopping. Don't forget to use the promo code BLKFRI for an additional 20% off your purchase. Check Macy's for details as the code excludes certain items.